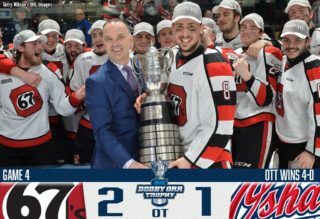 Owen Sound, ON – The Owen Sound Attack are proud to announce the naming of Nick Suzuki as the 23rd captain in franchise history with Sean Durzi, Kevin Hancock and Aidan Dudas serving as assistant captains. Entering his fourth year with the Attack, Suzuki has put up a total of 110 goals in 194 career regular season games played with Owen Sound. He’s landed a total of 237 points in his three seasons with the Bears. Suzuki, who was drafted 13th overall by the Vegas Golden Knights in the 2017 NHL Entry Draft, spent the better part of September at NHL training camps as he was traded from Vegas to the Montreal Canadiens on September 9th. 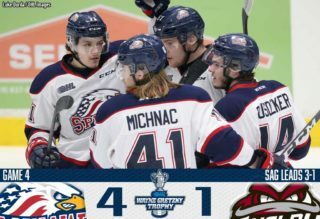 Playing multiple pre-season games with Montreal, it was not certain if Suzuki would return to the OHL, but on September 25th he was re-assigned to the Attack. Suzuki spent last season as an assistant captain to Jacob Friend. 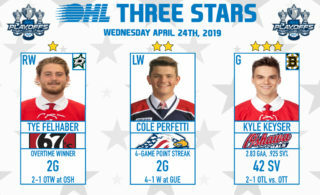 He finished fourth in overall points in the OHL last season, amassing 100 points (42-58–100) in 64 games played. Two of Suzuki’s assistants, Durzi and Dudas, both heard their named called this past summer at the NHL Draft with Durzi going 52nd overall to the Toronto Maple Leafs and Dudas going 113th overall to the Los Angelas Kings. Hancock remains undrafted, but is an integral part of the team’s veteran presence on and off the ice. 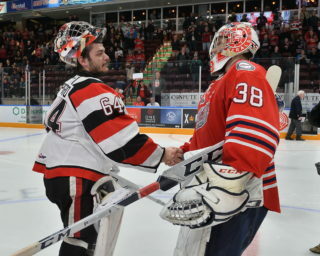 “It’s truly an honour to be named captain in Owen Sound, and in the same category as the great Attack captains before me,” Suzuki said. For more information visit attackhockey.com.